Philadelphia Police are looking for a suspect wanted for several incidents of Bias Graffiti in South Philadelphia. 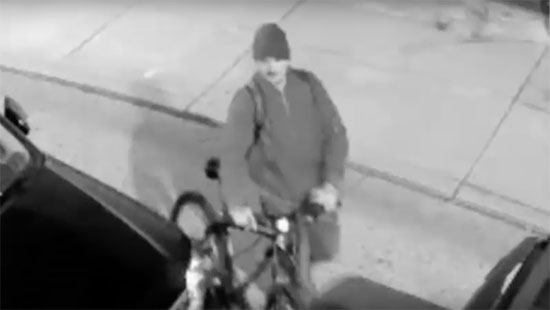 On November 20, the suspect was seen on surveillance cameras pull up on a bicycle at the SEPTA stop on Broad and Snyder. Police say he painted white supremacist messages on the wall, including a circle with a cross in it and the phrases 'white world' and 'white pride' and the numbers 14 and 88. The same messages were written in four other locations that day. Similar messages were also painted on the 2800 block of Moore Street on Nov. 11 and the 1300 block of Snyder Avenue on Nov. 19. If you have any information contact Philadelphia Police. Watch the video below. Philadelphia Police are investigating after the bodies of two men and one woman were found inside a home in the Tioga-Nicetown section. Police got a call about a possible robbery around 7:30 p.m. on the 1900 block of West Venango Street. A woman who lives at the house came home and opened the door to see the living room ransacked. She did not go inside and called police. Police found the woman on the second floor and the two men in the basement. According to Commissioner Richard Ross, the bodies were all wrapped in blankets. One of the victims is confirmed to be a 91-year-old man who lived in the home. The other victims have not been identified. The investigation in ongoing. Two men and a woman are in custody after a body was found in a blood soaked rug in the basement of a home in the Wissinoming neighborhood on Saturday afternoon, 12/1. Police responded to the 4000 block of Higbee Street around 2:30 p.m. after getting calls about suspicious activity. The victim apparently lived at the residence with his girlfriend and two young daughters. Detectives say that the landlord found the girlfriend and two other men in the basement cutting up a blood soaked carpet with the victim inside. All three were arrested. The identity of the victim or how he was killed has not be released.